Swarovski Online Subscription to determine Swarovski ERV; It's a terrific resource! Warner's Online Swarovski Books available on the internet at www.wbrbonline.com . There are various subscriptions available, so you pay based on how much informatino you need. You can view all the Swarovski details, including color pictures, Swarovski ERV, and much more, taken directly from their hard copy Swarovski books and updated annually. It is the only one of its kind on the internet!!! 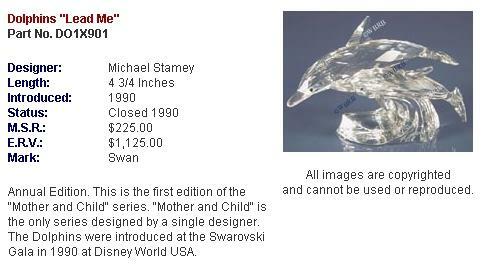 Below is a sample of a Swarovski figurine from the web site.